Epicardial (Pericardial) Fat Pad. Above: Frontal and lateral radiographs of the chest show an area of increased density at the right cardiophrenic angle on the frontal radiograph (white arrow) that does not silhouette the heart border (black arrow).There is an area of slightly increased density suggested on the lateral view (white arrow). 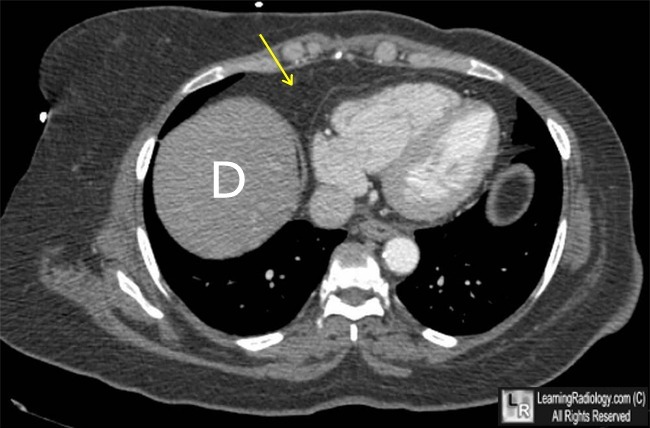 Below: An axial CT scan through the lower thorax shows an accumulation of fat (yellow arrow) in the space anterior to the heart and the right hemidiaphragm (D). Epicardial (Pericardial) Fat Pad. 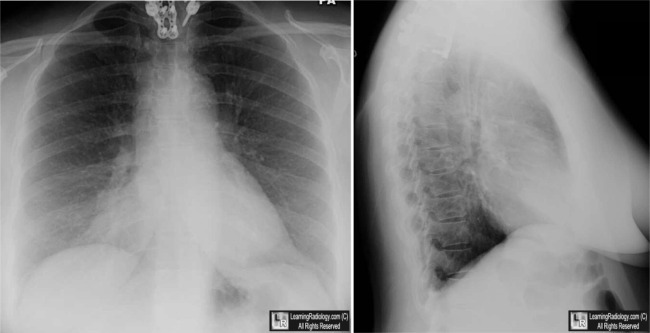 Another case: Frontal chest radiograph shows an area of increased density at the left cardiophrenic angle (white arrow) that does not silhouette the heart border. An axial CT scan through the lower thorax shows an accumulation of fat in both the left and right cardiophrenic angles (red arrows). Epicardial Fat and Its Association with Cardiovascular Risk: A Cross-Sectional Observational Study. F Mookadam, R Goel, MS Alharthi, P Jiamsripong, and S Cha. Heart Views. 2010 Oct-Dec; 11(3): 103–108. The Right Pericardial Fat Pad. SL Cohen. March 1953 Radiology, 60, 391-393.